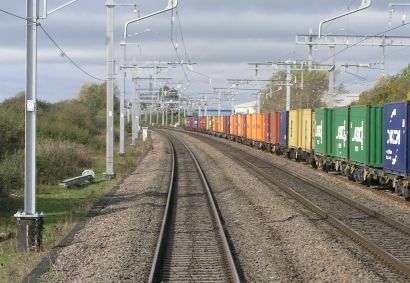 THE value of cargoes carried by British rail freight operators is more than £30 billion a year, according to a new report commissioned by the Rail Delivery Group. However, the total volume of freight carried by rail has dropped slightly again, mainly because of the continuing decline in coal movements as power stations switch to other means of electricity generation. The assessment by KPMG, called ‘Rail Freight: Working for Britain’, says that British businesses benefited by £1.2 billion in productivity gains because of rail freight, and that another £500 million was generated in other economic benefits. The types of goods carried include whisky, cars, clothing, cement, stone and oil. Container traffic, however, is buoyant, with more than one in four of the containers that arrive or depart from deep sea ports making their inland journeys by train. Rail Freight Group executive director Maggie Simpson has welcomed the report. Meanwhile, the Office of Rail and Road has confirmed that over the year to April 2018 construction and international rail freight were the strongest performing sectors, with growth of 1.5 per cent and 13 per cent respectively. This was despite an overall reduction of 1.7 per cent, which was driven by another 13 per cent reduction in coal traffic.